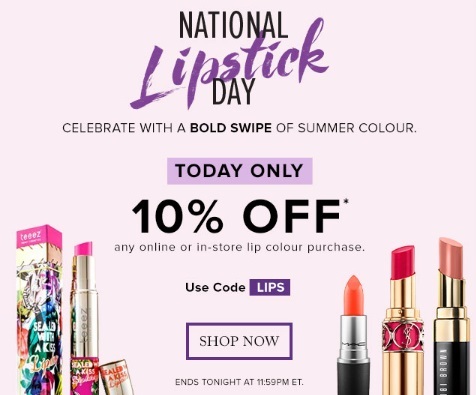 Hudson's Bay is celebrating National Lipstick Day today with a bunch of promos! Save $10 off your beauty or fragrance purchase of $75 or more with the promo code INSTANT (available for a limited time). Choose 2 Free select lip products with any $85 purchase (choose from Clinique, Burberry, Lancome or NARS). Click here to browse Hudson's Bay beauty.